Remember the last post about my love affair with Puff Pastry? Get ready to fall in love too. Freezing Happy is not just about pulling completely meals from the freezer. It's about having a freezer filled with a arsenal of tools to make your life easier in a variety of different ways. So on a Monday night when you have not yet recovered from the weekend, you can make an easy and complete meal by boiling some pasta, adding your favorite jarred sauce, a green salad and whipping a few of these amazing, melt in your mouth breadsticks from the freezer to complete your meal. Or serve them as an accompaniment to a large dinner salad. 1 (9.5x9") sheet frozen puff pastry, thawed on counter for 10 minutes. - Line counter top with silpat or wax paper. - Unwrap slightly thawed puff pastry sheet and spread open. - Cover with second layer of waxed paper and use a rolling pin to lightly press down to press cheese into dough. - Flip the dough over, carefully remove top layer of wax paper and repeat with remaining half of ingredients. - Replace wax paper and roll until the dough is 10.5" square. - Remove top layer of wax paper and use a pizza cutter to slice long strips that are 3/4" wide. - Gently twist each strip and then place it onto a silpat lined baking sheet, 1 inch apart. To freeze: wrap baking sheet with plastic wrap and freeze for at least 2 hours and up to 24 hours. Remove from pan and place in a gallon freezer bag. 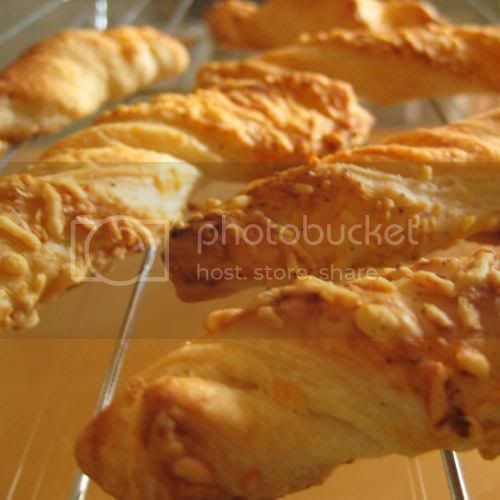 - Place needed amount of cheese straws onto silpat lined baking sheet. - Bake at 425* for 8-12 minutes or until golden brown. Let cool and serve. *Tip: How to tell it's real Parmesan. 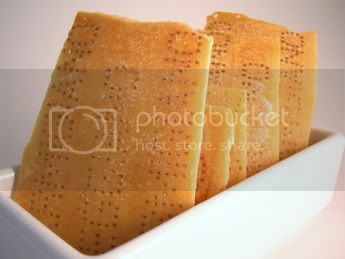 Real Parmesan cheese will have a stamp on the rind made of many small pinholes as shown above. Fake domestic Parmesan may have a rough looking rind, but if there is no stamp...it's not going to be as good. If the real stuff is too expensive for you, go with the domestic DiGiorno brand. I guess you can try using the grodey powdery can stuff, but it's not going to compliment the buttery goodness of the puff pastry and I'll probably be a bit mad at you. Sounds yummy! I'm gonna try this next week! Puff pastry is a home chef's secret weapon! you can make so so many things with it. I made a dish this last Halloween that was pastry stuffed with Nutella and Peanut Butter. Ooo, that looks so yummy! But shouldn't it be Freesy Cheesy Straws. Oops, I misspelled "Freezy". *sigh* I think it's past my bedtime.